The US is concerned about heightened tension in eastern Ukraine after pro-Russia demonstrators seized government buildings in three eastern cities, Donetsk, Luhansk and Kharkiv. Secretary of State John Kerry told Russian counterpart Sergei Lavrov in a phone call that any Russian efforts at destabilization “would incur costs”. They discussed the possibility of direct talks within the next 10 days. Ukraine is sending security officials to Donetsk, Luhansk and Kharkiv, after buildings there were stormed. Rebels occupying Donetsk’s regional government building declared a “people’s republic” on Monday and called for a referendum on secession from Ukraine to be held by May 11. Russia recently annexed the Ukrainian peninsula of Crimea, where the majority of people are Russian speakers, following a referendum that Kiev and the West say was illegal. Moscow now has thousands of troops massed along its border with eastern Ukraine. Although it insists it has no intention of invading Ukraine, it says it reserves the right to defend ethnic Russians in the country. Russia is refusing to recognize the new authorities in Kiev who took power after pro-Moscow President Viktor Yanukovych was ousted in February. US state department spokeswoman Jennifer Psaki said that in the telephone call, John Kerry “called on Russia to publicly disavow the activities of separatists, saboteurs and provocateurs” in Ukraine. She said John Kerry noted that the actions in eastern Ukraine “do not appear to be a spontaneous set of events”. “He made clear that any further Russian efforts to destabilize Ukraine will incur further costs for Russia,” Jennifer Psaki said. The US and the EU have already imposed targeted sanctions on Russian and Ukrainian individuals over the annexation of Crimea. Sergei Lavrov, in an article on the website of the UK’s Guardian newspaper, denied Russia was destabilizing Ukraine and accused the West of “groundless whipping-up of tension”. He also warned authorities in Kiev against any use of force against pro-Russian demonstrators. Russia’s foreign ministry said it was “closely watching” events in eastern Ukraine, “particularly in Donetsk, Luhansk and Kharkiv regions”. It reiterated Moscow’s demands for the creation of a federal Ukraine with broader powers for provinces. “Stop pointing to Russia, blaming it for all of the troubles of today’s Ukraine,” the statement said. Pro-Russian protesters seized official buildings in Kharkiv, Luhansk and Donetsk on Sunday night. 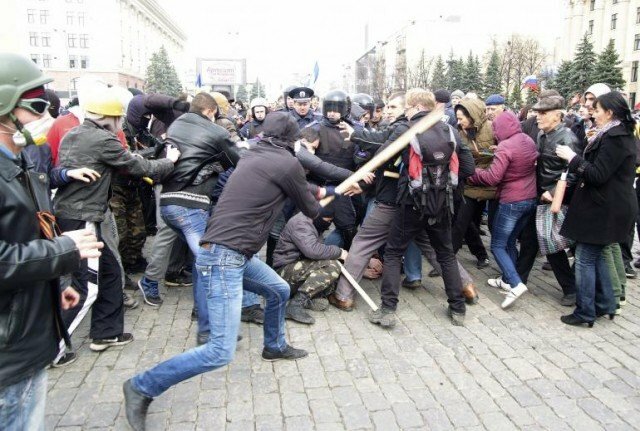 Police said they cleared protesters from the building in Kharkiv but in Luhansk demonstrators had seized weapons. Ukraine’s interim President Oleksandr Turchynov called the unrest an attempt by Russia to “dismember” Ukraine. Speaking on national TV, he said it was “the second wave” of a Russian operation to destabilize Ukraine, overthrow the government and disrupt planned elections. Also on Monday, NATO said it was limiting Russian diplomats’ access to its headquarters in Brussels.